Shop online and Shop local? You bet! Fill up your virtual bowl with the same great selection of premium pet food, treats, and everyday supplies like you are used to when shopping in store at The Green Spot. Enjoy affordable and convenient Local Delivery service to your home or office in the Omaha metro area, as well as Curbside Pick-Up at our 72nd and Pacific Street location. Stock-up on only the best natural, premium pet foods, organic dog treats, natural health vitamins and supplements. We also help make Clean-ups easy with our selection of all-natural cat litters, pet stain and odor sprays, bio pet-waste bags, potty pads, and lots more now with a click-of-the-mouse - and we do all of the heavy lifting! What areas do you offer Local Delivery services? Currently we offer services for the 20 mile radius that is the Omaha Metro. What if I live outside this area? Can I still request delivery? 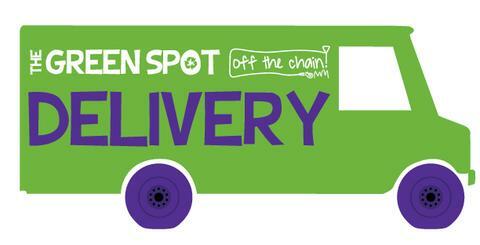 You can place an order online at: www.greenspotomaha.com or by phone during regular business hours (M-Sat 10a-8p or Sun 11a-5p) at (402) 614- SPOT. Yes, you can call us during regular business hours (M-Sat 10a-8p or Sun 11a-5p) at 402-614-SPOT. However, please understand that when placing an order by phone, we may be busy with in-store customers, and the wait time is variable. For the quickest service, we suggest placing your order online. How much do you charge for local delivery? What if my selected items are out of stock? If we are experiencing a product shortage, we will contact you to discuss your order. Typically you can choose a partial delivery or to wait until a complete delivery can be made. We deliver weekly and schedule based upon the volume of deliveries. Depending on when you place your order, your items will be delivered the next available delivery day.) On average your order should arrive within 2-4 days. If your delivery needs a rush, it will be delivered next day for a $5 rush charge. What time of the day will I receive my delivery? No. However, we are not responsible for lost or stolen items. Many of our valued customers trust us with a garage code or spare key placement, so that we can ensure your items are safe from any predators. Contact us if you'd like to arrange something with us for your deliveries. What if I order Raw? How will it stay cold? Yes. In your account settings, you can even set up more than one address for delivery so you can change locations for specific orders. Some office locations may require you to meet the driver at the curb to receive your order. The item I'm looking for is not on the website. If you do not see an item on the website, you may contact us via phone to add it to your order. We are adding new products weekly, and we may occasionally discontinue items that are no longer available. What is the Return Policy on orders from local delivery? Typically we can have it ready the same day. However, if you order past 5 pm, it is possible that your order will be ready the following day. You will be notified by email when your order is ready for pick up or is delivered. Do I need to show my ID when I pick up my order? Yes, we will require you to show your Drivers License (or another valid ID) and Credit Card (used to place the order) to pick up your order. If you would like someone else to pick up your order, you must make reference to this person's name in the Comments section when placing your order. You may also call the store to make this request. Can I choose In-Store Pick-Up? Yes, if you are located in Iowa or Nebraska. Be sure to choose "In-Store Pickup (72nd & Pacific - Omaha)" under the heading Shipping Method. You can also call the store to advise us you are on your way and would like to have your order ready to be brought out to your car when you arrive. Note that we may be busy with other customers at the time of your arrival so please call ahead to arrange this.